Dr. Seuss was a genius when it came to writing books that appeal to kids of all ages. One of the reasons that Dr. Seuss books have been popular for generations is his use of nonsense words. 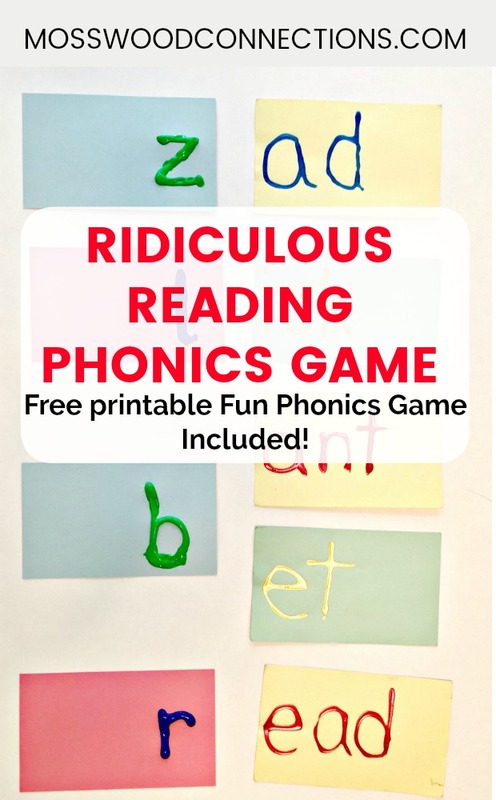 This Ridiculous Reading Phonics Game was made with Dr. Seuss in mind. Because a child cannot guess what the word says, they have to have some phonics awareness so that they can sound it out. 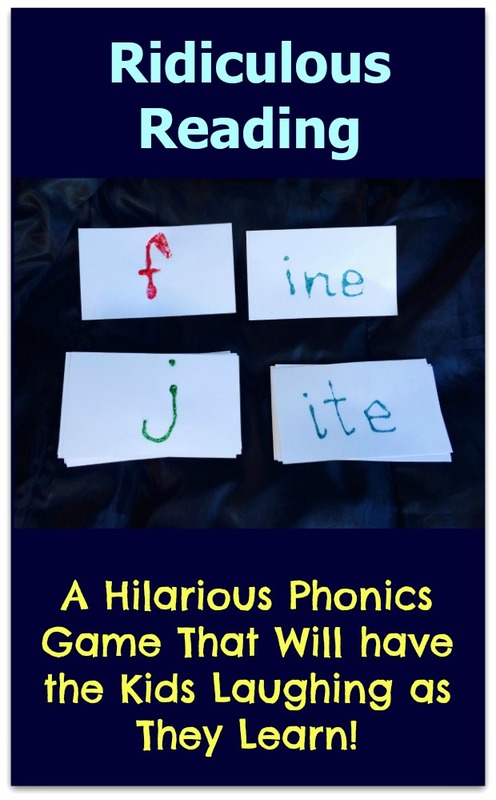 That use of nonsense words to encourage phonics, combined with humor, inspired this game. I came up with this game while I was working with a six-year-old with dyslexia. We were having good success with the Seeing Stars Phonics Program, but while Seeing Stars can be very effective in helping struggling readers it’s…well, not that much fun. As a play therapist, I prefer it when children laugh while they learn and this game is a lot more fun than what we had been doing. It also has the added benefit of adding sensory to the reading. It is always best to introduce new or difficult concepts in a multi-sensory way. Multisensory instruction is a way of teaching that engages more than one sense at a time. For kids with reading issues like dyslexia, the use of sight, hearing, movement, and touch can be helpful for learning. By using the puff paint to write and trace the letters you are making reading a multi-sensory activity. Make two sets of cards. The first set will be single letters and consonant blends (i.e. “bl”, “st”, etc.). The second set will be word endings. The 37 most common word families in English (according to Wylie and Durrell) are: ack, ain, ake, ale, all, ame, an, ank, ap, ash, at, ate, aw, ay, eat, ell, est, ice, ick, ide, ight, ill, in, ine, ing, ink, ip, it, ock, oke, op, ore, ot, uck, ug, ump, unk. Have the child trace the letters with the puff paint. As there are a lot of cards to make, adult help will make the job go more quickly. Allow the cards time to dry. Make two piles with the cards face down. The pile on the left is the letters and consonant blends. The pile on the right is the word endings. Take turns picking one card from each pile. I have the child trace the letters with their finger as they read. If the two cards make a real word it scores one point. I give half a point if the child can come up with a colorful definition for the nonsense word or think of a rhyme. To extend the game, make sentences using the words that you made or choose three words and use them to make a sentence. Be silly, if you are having fun the kids will have fun, too. While the multi-sensory approach is preferred we don’t always have the time to make the phonics cards so we also made a printable Phonics Fun Game. 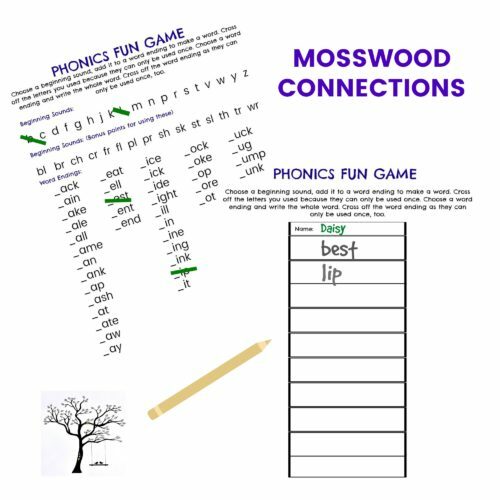 In this version of this fun phonics game have the children choose one word beginning and one word ending to make a complete word. Then have them write the words in their word boxes. To bring some fun and joy make up a song to go with the words they wrote. Choose one word ending and see how many rhyming words you can come up with.